Suggesting that a player was not good enough to make the 1927 New York Yankees is hardly an insult. The original Murderers Row is widely considered the greatest club ever to take the field. Spud Davis’ first opportunity to break into the major leagues was with the ‘27 Yankees, and while he did not make that club he did go on to have a very good major-league career, including playing for a World Series winner with the St. Louis Cardinals. Virgil Lawrence Davis was born December 20, 1904 in Birmingham, Alabama, the son of John and Kate Davis. According to the 1910 census, the Davis family lived in the household of Kate Davis’ mother Zillah Schwinn in the Jefferson neighborhood of Birmingham. The household listed ten different people (including Spud’s sister, Helen) with six different last names. By 1920 Virgil’s family lived in a different household in Jefferson as the step-son of George Hanlin, who by this time was married to Virgil’s mother. Whether John Davis passed away or was separated from Kate Davis is unknown. Davis did not make the roster of the legendary team, but Commissioner Kenesaw Mountain Landis ruled that the Yankees had too many players out on option. Landis then subjected a few of the players, including Davis, to waivers where they could be claimed by another team, and Davis was snagged by the St. Louis Cardinals. Spud played the 1927 season for the Reading (PA) Keystones of the Class AA International League, an affiliate of the Chicago Cubs. Catching almost every day, Davis hit .308 for the season, his last minor-league action for 20 years. Davis made his major-league debut on April 30, 1928 as the Cardinals played host to the Reds. He started behind the dish for the Redbirds, opposite Bill Sherdel on the hill. Davis went 0-2 at the plate before Ray Blades pinch hit for him. Davis’ next game on May 8 was a 15-4 shellacking of the Phillies in which Davis recorded his first hit, run, RBI, and walk in the major leagues. After only those two games with the Cardinals, Davis was traded on May 11 to the Philadelphia Phillies with two other players for a package of three players highlighted by catcher Jimmie Wilson. While Davis left the pennant-winning Cardinals for the 43-109 Phillies, he didn’t mind the switch, saying many years later that he was happy to go anywhere that he could get a chance to play2 Spud hit his first career home run on with the Phillies on June 8, taking Sheriff Blake of the Cubs deep for a game-winning three-run shot in the bottom of the eighth of the Phillies’ 6-5 win. Davis finished his rookie season hitting .280 with three home runs and 19 RBIs for the last-place Phillies, who finished 51 games behind the Cardinals squad he had begun the season with. Davis split the catching duties for the Phillies with fellow rookie backstop Walt Lerian. Lerian and Davis again split time behind the plate for the Phillies in 1929. Spud appeared in 98 games, hitting .342, his first of seven straight seasons at or above .300 and ten seasons overall throughout his career. Davis became the Phillies’ primary backstop in 1930, not so much because of his play but because of tragedy. Just weeks after the conclusion of the 1929 season, Walt Lerian was killed in Baltimore when a delivery truck jumped a curb at a trolley stop and caught him as it ran into a building. From 1930-33, Davis was one of the best offensive catchers in baseball, averaging a .333 batting average with ten home runs and 63 RBIs. While the Phillies of this era struggled in the standings (finishing above .500 in 1932 for the only time between 1918 and 1948), the team routinely put up impressive offensive numbers, no doubt helped by playing their home games in the hitter-friendly confines of the Baker Bowl. Davis had one of his best years in 1933. He hit .349 for the Phillies while playing in 141 of the team’s 152 games. Davis’ batting average was good enough for second in the National League and third in all of baseball, trailing only each league’s batting champ, teammate Chuck Klein in the National League and Jimmie Foxx of Philadelphia’s other major-league team. in the American League. Spud’s .395 on-base percentage was also second in the NL, again trailing only Klein. Despite his tremendous success with the bat, Davis was not seen as an exceptional defender. He struggled with weight issues, thus making catching more difficult, and routinely ranked among the league leaders in stolen bases allowed. Likely because of how many runners attempted to steal against him, Davis also routinely ranked among leaders in runners caught stealing. He did lead the league’s catchers in fielding percentage with a .994 mark in 1931, committing only three errors and contributing 78 assists from behind the dish. The 1930’s era St. Louis Cardinals have gone down in history as the Gashouse Gang, the scrappy, unkempt squad known for its antics as much as its play. Colorful characters such as Pepper Martin, Dizzy Dean, and Leo Durocher filled the roster. The Gashouse Gang was not just colorful, however- it was really good. The Cardinals won the National League pennant in 1930, and won the World Series in 1931 and again in 1934. Like many ballplayers, Davis was superstitious. For a few days in July of 1934 he asked pitcher Dazzy Vance to recite a Seminole prayer over his bat before going up to hit. One game when Vance was in the bullpen, Spud went hitless. For the next game, in Boston against the Braves, Vance performed the ritual for Davis before his at-bats in the second and fourth innings, and Davis got two hits. Vance was in the bullpen for Davis’ fifth-inning at-bat, and Davis grounded out with two runners on. Seeing that he was likely to come to the plate in the seventh, David begged reserve infielder Pat Crawford to take his bat to the bullpen for Vance to perform the ritual. “Much against his better judgment, (Crawford) carried the Davis war club out to the bullpen for the Vance Seminole medicine.6 Vance willingly quit warming up for a minute, stroked the bat affectionately and muttered the words of the Seminole chiefs. Crawford, feeling very foolish, carried the bat back to the dugout and the happy Davis strode to the plate with the bases filled and whacked a single through the box. Two runs scored on the base hit of the Seminole medicine.” Davis had three hits, two RBIs, and scored two runs in the 5-3 Cardinals victory. Davis caught 94 games for the Cardinals in 1934 but made only two appearances in the seven-game World Series victory over the Tigers, both as a pinch hitter. He singled in both at bats, and following his hit in Game Four was pinch run for by Dizzy Dean. Dean was subsequently knocked unconscious when he was hit in the head by a throw by Detroit shortstop Billy Rogell. Dean eventually came to and started on the mound for the Cardinals the next day. At the end of the 1939 season Davis was about to turn 35 years old and had not had a particularly successful season since the 1935 campaign in St. Louis. 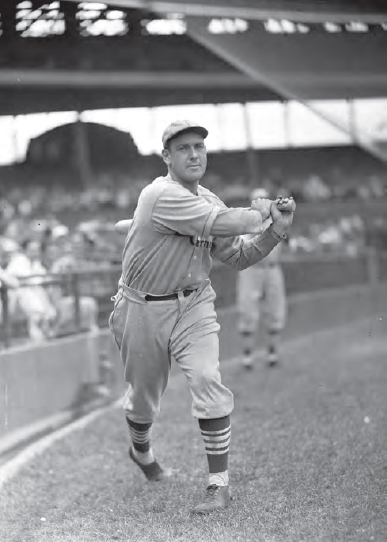 Around this time Frankie Frisch, Davis’ old teammate and manager with the Cardinals, took over as the skipper of the Pittsburgh Pirates. Frisch’s first move after taking the reins was to purchase Davis from the Phillies. As a 12-year veteran of the major leagues, Davis had carved out a decent living for himself in Depression-Era America. His 1940 U.S. census record indicates that he earned greater than $5,000 for the year (around $85,000 in 2013 dollars) and that he had other sources of income than just playing baseball. Spud, his wife Helen, and son Virgil, also had a live-in housekeeper, another sign that the Depression was not as severe for the Davis clan as for many American families. Davis spent two seasons with the Pirates, regaining his .300 form with (hitting for ; note-Davis hit .307 with the Phillies in 1939.) a .326 average in 99 games for Pittsburgh 1940. At the end of the 1941 season he was released from the active roster with the understanding that he would have a role in the organization, whether as a coach, minor-league manager, or scout.10 Two months after his October release Spud was named a coach on Frankie Frisch’s staff, a position he would hold through the 1943 season. In 1944, with the U.S. involved in World War II across Europe and the Pacific, the supply of young men available to play major-league baseball was diminished. As such, the Pirates needed a catcher and found one on their own coaching staff, as Spud Davis strapped on the tools of ignorance once again and resumed his playing career at age 39 after a two-year absence. Appearing in 54 games as a backup to starting catcher Al Lopez, “Old Folks” (as Davis was referred to in the Pirate dugout) again hit over .300, logging a .301 average in 93 at-bats.11 After one more season on the field during the similarly war-affected 1945, Davis retired back to coaching for the 1946 season. It proved to be his last with the Pirates, as Frisch was let go as manager late in the season and Davis served as the interim skipper for the Pirates’ last three games. Davis made one more foray into major-league baseball, joining his old pal Frankie Frisch as an assistant coach when Frisch took over as the permanent manager of the Chicago Cubs for the 1950 season. He remained with the Cubs until the conclusion of the 1953 season, two years after Frisch’s departure. After being let go by the Cubs, Davis retired to his hometown of Birmingham, living on his baseball pension and a bit of money he had saved from his career in the game.13 He was inducted into the Alabama Hall of Fame in 1977. He remained in Birmingham from the time he retired until his death on August 14, 1984 at the age of 79, after which he was buried at Birmingham’s Elmood Cemetery. This biography originally appeared in "The 1934 St. Louis Cardinals The World Champion Gas House Gang" (SABR, 2014), edited by Charles F. Faber. In addition to the sources listed, the author also consulted Ancestry.com and Baseball-Reference.com. 1. “Yanks Buy Third Baseman.” The New York Times, September 7, 1926, 29. 2. Paul Green. Forgotten Fields. (Waupaca, WI: Parker Publications, 1987), 165. 3. John Heidenry. The Gashouse Gang. (New York: Public Affairs, 2007), 126. 4. G.H. Fleming. The Dizziest Season. (New York: William Morrow, 1984), 89. 5. Michael Eisenbath. The Cardinals Encyclopedia. (Philadelphia: Temple University Press, 1999), 165. 8. Reading Eagle, September 14, 1937. 10. “Pirates Drop Catcher Davis.” The New York Times, October 3, 1941, 33. 11. Chester Smith, “Davis Predicts Pirates Will Be Tough to Beat.” Pittsburgh Press, March 24, 1945, 8. 12. “Davis Quits Bucs For His Business.” Pittsburgh Press, January 20, 1948, 19. 13. “Gas Housers Best, Davis Claims.” Milwaukee Journal, May 1, 1959, 33.